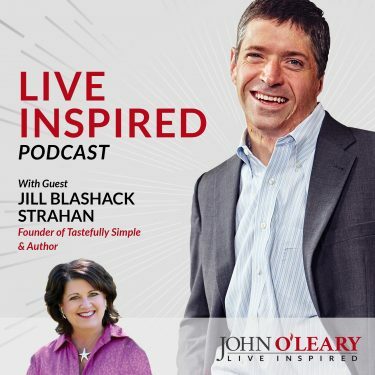 Jill Blashack Strahan shared this when reflecting on how she found significance and success as Founder & CEO of Tastefully Simple, despite experiencing tragic loss when her spouse and two brothers died much too early in life. 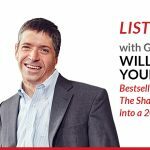 You’re going to love hearing from my dear friend, client & author, Jill. From simple joys growing up on a dairy farm in Minnesota to the wisdom her grandmother continues to share today through books she recommended decades ago: Jill’s story will remind you that you were put on this earth to shine. The Serenity Prayer helped Jill to not be reactive and stay centered during the hardest times in her life. Fear is about what we’re thinking. Thoughts control emotions. Emotions control actions. Don’t get caught up in fear. We say ‘why me’ when bad things happen, but why not say ‘why not me’? What makes me so special? If you don’t have motors in your life and you have anchors, they are going to pull you down and drown you. Be around positive people that pull you up and plant positivity, not fear. Whatever is given to you is meant to be a gift in some way, it’s not a way to hurt you or pull you down or destroy you. Fear is a gatekeeper to strength always. Business is about ebb and flow and finding the “new right answer.” I have learned so much in the last two years, we changed our paradigm, from home tasting parties to one-to-one & online channels. Order your copy Jill’s book Simply Shine here. Learn more about having Jill speak here. 1. What is the best book you’ve ever read? Jonathan Livingston Seagull by Richard Bach was significant for me. Today We Are Rich by Tim Sanders was another that was very timely for me. 2. Tomorrow you discover your wealthy uncle shockingly dies at the age of 103; leaving you millions. What would you do? I would give a lot that money away. Tastefully Simple has financially afforded me much in life. I would definitely want to build a park in little Villard, MN. 3. Your house is on fire, all living things and people are out. You have the opportunity to run in and grab one item. What would it be? Old photos that I don’t have digitally. Especially so that my son Zach would have them, memories of his dad. 4. You are sitting on a bench overlooking a gorgeous beach. You have the opportunity to have a long conversation with anyone living or dead. Who would it be? It would be my Grandma Aida who gave me the books I mentioned. She was very well read and very understated. She was not one who espoused her intelligence, but I would love to know more about her perspective on life and our family dynamics. 5. What is the best advice you’ve ever received? Always go least to most, if you give too much and take away people lose trust. When in doubt do without. 6. Looking back, what advice would you give yourself at age 20? I would make sure that I knew the Maryann Williamson quote about worthiness and I would make sure that I knew that I am worthy and that God expects me to shine. That’s one of the best things that shifted my thinking in my mid-30s. We are here to shine, not to feel unworthy. 7. It’s been said that all great people can have their lives summed up in one sentence. How do you want yours to read? She helped people shine and become more of who they are. If you enjoyed today’s episode: Subscribe (automatically get new episodes), rate and review (grow the Live Inspired. movement) this podcast anywhere you get your podcasts. Wow she explains the way I felt in my first marriage! I could never explain why I was unhappy or wanted a divorce when someone would ask me, but I feel like she was feeling the same way I did and she explains it so well!! I think we try to mold ourselves into how others perceive us or how others think we should be in order to make others happy that we lose who we are and what makes us happy as a human being!! I think your podcasts are an inspiration! !